As young employees enter the work force looking for that dream job, the standard advice is often to find a mentor – identify someone, see how they got where they are and follow their path. But for me, none of that made sense. The path I wanted to take didn’t exist. The career I wanted needed to be created. And I knew I had to be the one to do it. Just 10 years ago, many of the jobs in our current market didn’t even exist, such as a data scientist, social-media manager or director of sustainability. In fact, according to the Institute for the Future, 85 per cent of jobs in 2030 don’t currently exist. A million new career paths are yet to be forged and young people are well positioned to use this to their advantage. Out of university, I had a passion for the world of hospitality, but it was more than that. I not only wanted to provide wonderful experiences for people, I wanted to educate. I wanted to teach guests something new and allow them to be able to recreate the experiences for themselves. In my work as a restaurant manager, I saw that the beer consumer was changing. People were more interested in trying different flavours and styles of beer. More consumers were choosing beer as their beverage of choice. In a mutually symbiotic relationship, both brewers and consumers were experimenting. Having my finger on the pulse of this shift as it was just in its infancy provided a tremendous opportunity. By looking ahead and understanding the changing market, it was now up to me to take advantage. I knew I wanted to make a greater impact on the way people think about beer, and knew I needed to go big. I set my eyes on Labatt. Beer has been around for centuries and it seems to always have been associated with men. Guys’ night out. Having a beer with the boys. But this wasn’t the reality that I saw for the future. Beer has a much broader audience, a sophisticated audience at that, and I noticed it on the ground level. 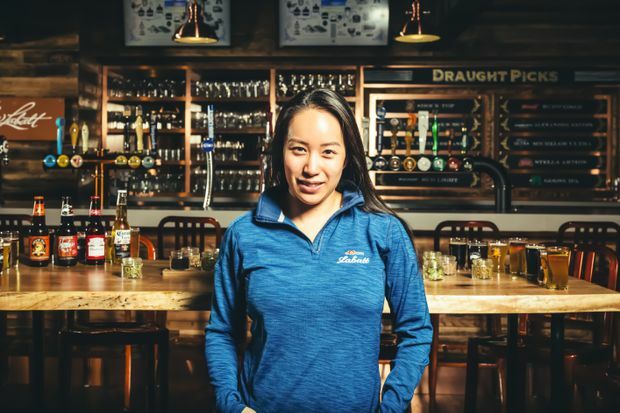 Beer has always had female champions both in the industry and in its consumers and I could tell this was only going to grow as the category grew. In order to distinguish myself from my peers and be able to offer something different, I became a Certified Cicerone. A relatively new accreditation, the cicerone certification was founded in 2008 as the sophistication of beer drinking was beginning its ascent. The program certifies individuals with the professional knowledge and tasting skills required to elevate the beer experience similar to what a sommelier provides with wine: pairing beer with food, assessing beer quality, identifying beer styles, and expertise in beer ingredients and the brewing process. It provided me with a more fulsome understanding about a huge aspect of the hospitality industry and a certification that was still quite rare in Canada. And here I was, a woman with a vast interest in beer and beer education, newly certified and witnessing a market that seemed to be evolving by the day. I had something to offer and I had a unique perspective. I knew there was no one else with my singular combination of skills and certification, and I knew that I could offer something that no one else could. Through dedication and hard work, I was able to achieve what I set out to do and launched my career at Labatt. I was the very first Certified Cicerone they hired. I started as a specialty portfolio manager and was able to work toward creating a new position, my current role as head of education for one of the country’s leading brewers. And as a woman who is passionate and knowledgeable about beer, I could speak to a growing demographic and with my colleagues, bring a perspective on how education could generate growth for the industry overall. A dream job is something to work toward, not something that is achieved quickly or without purposeful dedication. It is what one can provide that no one else can that will set a prospective employee apart. Don’t be discouraged if your dream job doesn’t exist – yet. There is so much opportunity to build a résumé that doesn’t look like anyone else’s and create a new role that meets the evolving market’s demands.